Camp Springs is one of the largest communities in Prince George’s County. About 19,000 civilians and 7,000 military families reside in Camp Springs. We’re bordered by the towns of Morningside, Clinton, Temple Hills and Ft. Washington. The location of Camp Springs, just outside of the Capital Beltway, allows for easy and quick access to the nation’s capital either by personal vehicle or public transportation. One of the County’s 15 metro stations is located at the Camp Springs Town Center (the Branch Avenue station). Metro bus and “The Bus”, which is run by the County, are also convenient transportation alternatives. Camp Springs is home to the single largest employer in Prince George’s County, Andrews Air Force Base – now Joint Base Andrews. We also have numerous small businesses in Camp Springs to include an art gallery, hotels, restaurants and a senior citizen’s center. We’re a 10 minute drive to National Harbor, where you can dine and shop. On your scenic drive through Camp Springs, you will notice mostly single family homes as a backdrop to tree-lined streets and well-manicured lawns. There are numerous churches including the more than 100-year-old Bells Methodist Church on Allentown Road. It is the oldest structure in Camp Springs built in 1910. 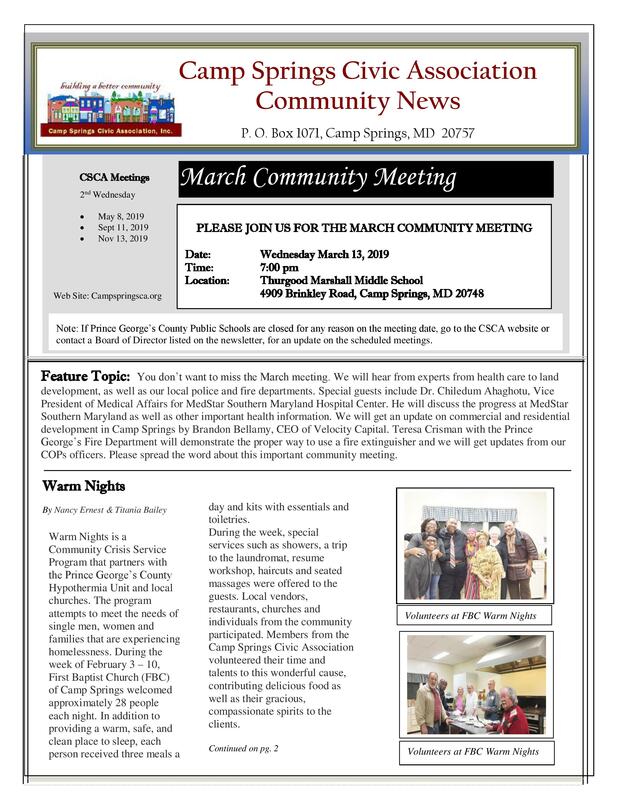 The many civic-minded residents of Camp Springs invite you to visit and enjoy. Everyday we’re building a better community. I did not like the article in the Washington Post that down graded our community. The article made us look like we are uneducated,poor and everybody earns less than $50,000.00 and so forth. We have a strong civic association and the most friendly community. The Washington Post writer should apologize for his comments. I’ Ve lived in this community for 39 years and have not had a problem and for him to call our community poor is outrageous. Glad to be one of the businesses serving this area.